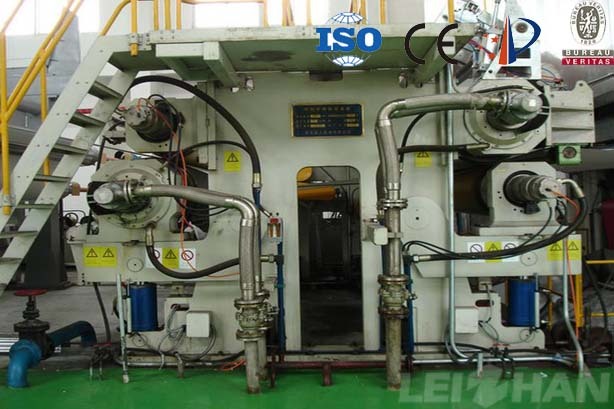 Calendering machine is used to improve the gloss of the paper. Generally, the gloss of the paper is about 65-85%, and the gloss can reach 90 to 95% after the calender. What are the factors that affect the effect of paper calendering? General speed increase, the effect of calendering will be reduced. When the speed is high, the paper page passes through the pressure area instantaneously, so it is hard and elastic, and the effect of calendering is reduced. Therefore, the speed is increased, and the line pressure should be increased, and the number of rolls will be increased correspondingly. Some high-speed paper machines can even set up two calender machines to extend the time of pressing. The higher the line pressure, the stronger the compression effect in the pressure zone, the better the transfer effect. However, it must be pointed out that the improvement of the effect is limited. After a certain limit, the effect of the calendering will not increase, and the mechanical strength of the paper page will be greatly reduced. 3. The number of pressure zones passed. The higher the number of pressure areas, the higher the effect of calendering. Generally speaking, the paper page is relatively soft and plastic, it is easy to produce good transfer effect in the pressure area, so as to improve the effect of calender. The higher the temperature of the pressure zone, the more favorable the plastic deformation of the paper page, so it is beneficial to improve the effect of calendering. It has been proved that under higher temperature, it can obtain better calendering effect under lower line pressure and less pressure zone. This can greatly reduce the impact of the mechanical squeeze on the page strength and other side effects. 6. Type of calender roller. The calender roller is a hard cold cast iron roller. For the uneven surface of the paper, the roll surface will only touch the protruding part of the surface, but the lower part will not touch. Degeneration of the soft calender technology, the use of elastic roller absorbs the unevenness of paper, so that the paper completely and iron roller surface contact, after calendering, the tightness of smooth and continuous of sheet change, the sheet surface feature is invalid; In addition, the pressure area is wide, the calendering is long and the pressure is lower than the pressure, so that the thickness can be reduced less (the strength loss is small), and the smoothness is improved. Page when the moisture content increased, the plastic, is advantageous to the calender, but when moisture content is too big, can compress too closely, make to increase transparency, sheet looks dark, namely appear black phenomenon. Therefore, water content is generally controlled at 6-8%.